Rise of the Sea Witch by Stacey Rourke is the compelling and tragic origin story for the famed sea witch that stole a little mermaid's voice. When Princess Vanessa's mother dies, she's left to fight for her father's approval while her little brother, Triton, is fawned over and easily coaxed through all his training. Fighting for her voice to be heard, Vanessa discovers a hidden talent for magic, as well as secrets regarding her birth. As humans wage a war upon the kingdoms of the sea, political sides are chosen as Vanessa and Triton end up vying for the crown, with decisions having serious consequences for them both. In this story expect to find Easter eggs about the Disney classic. It was a nerdy kind of fun to see these little nods to the film, including lines from “Poor Unfortunate Souls.” Greek mythology plays a large role in the story with Hades and Poseidon, and a Kraken. Vanessa is everything that Ursula isn't (at least not yet). She's compassionate and loving, yet has the same drive and craving for power with little hints that show the villain that she's going to become. She's easily likable, endearing, and garners a lot of sympathy. All she wants is to be taken seriously, to have her father's attention, be respected. Reading Stacey Rourke's take on Ursula's story gave me a whole new view on The Little Mermaid, seeing a villain in a sympathetic light. There are darker elements that pay homage to the original fairytale by Hans Christian Anderson. 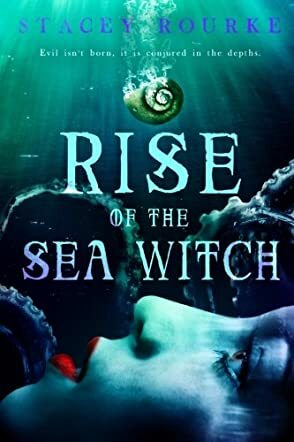 Rise of the Sea Witch is a delightful and dark origin story that more than lives up to the original tale, with all the fun of the Disney film, and all the tragedy of the fairytale. I loved it!